Seattle Cosmic met again on 24 May at the house of Dave Adams and Kathy Kizer in Tukwila. The meeting was scheduled for the house of Tim Higgins, but Tim was otherwise engaged, and Dave and Kathy won a virtual die roll to host it. Present were (in rough order of appearance) Dave Adams, Alex Rockwell, Kisa Griffin, Chris Bender, Mark Purtill, Nat Dupree, Steve Dupree, Alex Swavely, and Kathy Kizer, for a total of nine people. I "predicted" in last week's newsletter (SeattleCosmicGameNight20030517) that there would be exactly as many people this week as there were last week. That's because I had already had intelligence from Kisa, and he told me there were only eight people, saying Kathy arrived late and didn't play anything. However, we can see in the photos below that Kathy played Filthy_Rich? late in the evening, perhaps after Kisa left. Kisa also said that one of the Alexes (I'm pretty sure he said Swavely) left early, but we can see both Alexes in the second Filthy Rich photo. 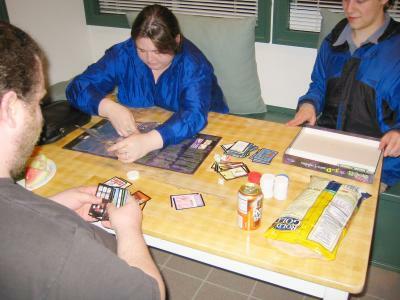 Also, was a game of Star_Munchkin? played, or not? And who is the mysterious person at the right in the Barbarossa photo? And are they playing, or just observing? Mystery upon mystery. It may be that the only mystery solved from that evening was the Mystery_of_the_Abbey?. Nevertheless, won't you help solve a few by adding your own comments? Mystery of the Alexes solved! Alex Swavely did not indeed leave early (at least not really, it was nearly midnight, Barbarosa was being called done at the time), but instead arrived way late, returning both copies of Ocean's Eleven he borrowed previously. 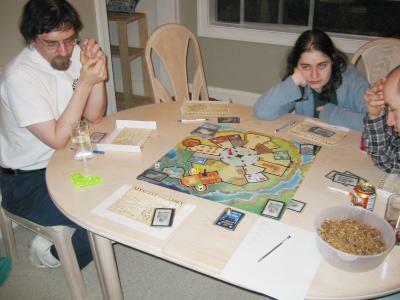 The Alexes did not play Star_Munchkin?, they played Munchkin?. And this whole discussing himself in the third person thing is rather an annoyance to Alex, so he'll quit it now..
Mystery of the Mysterious Person solved! The mysterious person might have been Kathy's mother. Or someone else's mother. And there were prizes - Dave generously provided some squirtguns. Yes, Kathy told me it was her mother. 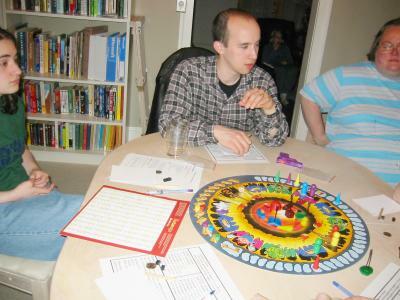 As Kisa was arriving, Dave and Alex were playing a few games of the Harry_Potter_CCG?. By the time Harry Potter had finished, several people were present. Four played a game of Wongar?. Chris Bender won. Kisa tells me they were playing with a couple of rules wrong. While the other four were playing Wongar?, Nat, Steve, and Mark played a game of Fresh_Fish?. I don't remember the specific scores this many weeks later, but I might have gotten something like -7. Nat might have done better than Mark by some unspecified amount, but I wouldn't bet money on that fact. Regardless, it was definitely a fun game and one of the most interesting I've played. Considering that I've played multiple times to Nat's 1 and Mark's 0 times, my score isn't that much to be proud of. --Steve_Dupree? 1. Mystery of the Abbey beats Can't Stop for over-the-top excitement! 2. Kisa 'splains yet again. After Wongar? and Fresh_Fish?, five players started a game of Mystery_of_the_Abbey?. Kisa was the winner. His four-point score suggests he actually guessed the murderer, although there are other ways to get four points. Kisa did, indeed, guess the murderer. For a few rounds I had been asking the other monks questions about a Brother Sergio or some such. Unwittingly I failed to realize the import of the large number of "No, I haven't seen him" answers I was getting. But Kisa was not so oblivious, asked me if I had seen him just to make sure I hadn't been bluffing, and got the correct monk arrested. Duel of Ages? Well, Chris does seem to be older than Alex. 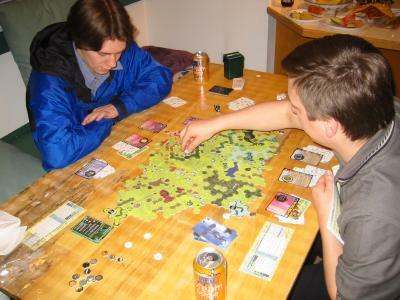 While the other five players present played Mystery_of_the_Abbey?, Chris and Alex played Duel_of_Ages?. 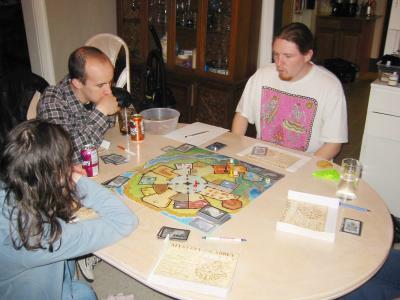 Around this time, Alex Swavely showed up, and there may or may not have been a three-player game of Star_Munchkin? with Chris Bender and the two Alexes. Kisa told me that after this game Chris Bender and Alex Swavely went home, but I think he meant Alex Rockwell, because we have photos of Alex Swavely from later in the evening (see below). Come to think of it, we seem to have a photo of Alex Rockwell too. Alex S arrived late to witness Alex R challenging Chris to a two-player game of Filthy_Rich?. Alex S served as Signmaster for the latter portion of the game, and gets in on the second. Chris took off after the second game of Filthy Rich, and a Barbarossa game coalesces in the dining room, so the Alexes grab a copy of Munchkin? off Dave A's game shelves and proceed to play an explanatory game in the nook. Unseen person guesses while mystery person looks on. Kisa tells me that after Chris and Alex left, the remaining six players played Barbarossa. He said it was the "most score-focused" game of Barbarossa he had ever played. Steve Dupree had a runaway start, but then LederHosen set in and everyone else refused to guess Steve's sculptures, costing him points. In the end, Dave was the winner. 1. Alex Swavely gets filthy. 2. Kathy gets filthy too, and Alex Rockwell likes to watch. Kisa remarked that after Barbarossa, around 11:45, pretty much everyone packed up and went home. It looks from Dave's photos that Alex Swavely did stick around to play Filthy_Rich?, and that Kathy did indeed play a game. And is that Alex Rockwell in the upper-right corner of the second photo? Alex0 recalls the tactics used by Chris Bender in their games previously, and uses them to great advantage (in game 1, Alex0 forced Kathy into bankruptcy and wins her luxuries in the resulting auction, pushing him over the luxury limit and winning the game.. 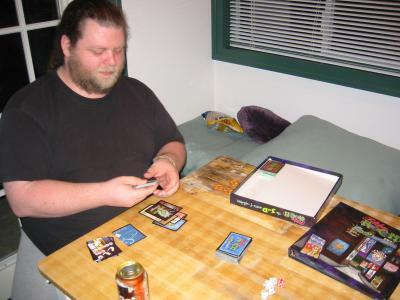 In game 2, he forces both opponents into bankruptcy on the same turn and wins by default). Thanks to Kisa for reporting as much as he did from memory, without the aid of any notes. I doubt I would have done as well. Thanks also to Dave Adams for contributing photos this week. Thanks to Marty Hale-Evans for help with the captions. Saturday, 31 May 2003, 5:00 PM at the house of Dave Howell and Eric Yarnell in Tukwila. Come play for fun and FABULOUS PRIZES from the PrizeBag!